The host Zags beat Santa Clara 91-48, their 23rd straight victory in a WCC opener. Gonzaga has defeated the Broncos 18 times in a row since 2011. SPOKANE – Santa Clara never had a chance with No. 7 Gonzaga at full strength for the first time this season. 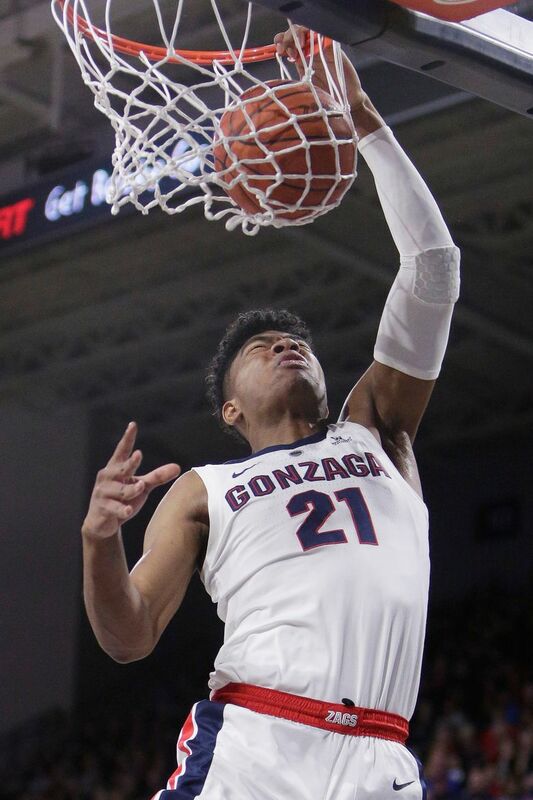 Rui Hachimura scored 25 points, Brandon Clarke added 16 and Gonzaga routed Santa Clara 91-48 to open defense of its West Coast Conference men’s basketball regular-season title. With key contributors Killian Tillie and Geno Crandall back from injuries, Gonzaga (14-2) posted its 18th consecutive victory over Santa Clara since 2011. Josh Perkins had six points, five rebounds, five assists and four steals. Keshawn Justice scored 14 points, Josip Vrankic had 11 and Tahj Eaddy 10 for Santa Clara (9-7, 1-1). The Broncos had won six in a row. “We’re going to keep working to get better, and learn from this experience,” said Santa Clara coach Herb Sendek, a former Arizona State coach. Gonzaga has won 23 straight WCC openers, with its last loss in 1996. The Zags have won six straight WCC regular-season titles. But the West Coast Conference had a strong nonconference record, and Few is expecting plenty of battles in the next two months. The Zags used a stout defense to run away with this game, holding Santa Clara to 33 percent shooting. The Broncos made a mere 4 of 17 from three-point range and 10 of 22 free throws. They also committed 23 turnovers. Hachimura scored 14 of his points to help Gonzaga jump to a 22-10 lead. “I want him aggressive 24 hours a day, seven days a week,” Few said, when asked if Hachimura was asked to play strong at the start of the game. A 9-1 run put the Zags ahead 33-14. Gonzaga led 50-27 at halftime behind 18 points by Hachimura. The Zags shot 56.7 percent in the first half while holding Santa Clara to 35.7 percent. Hachimura converted a three-point play to ignite a 16-3 run that put the Zags up 70-34 midway through the second half. Tillie (five points) played his first minutes of the season after suffering an ankle injury in preseason practice. Crandall (eight points) also returned Saturday after missing a month with a fractured hand. Thus Gonzaga was at full strength for the first time this season. Few said the return of Tillie meant forwards Hachimura and Clarke can play harder without worrying so much about foul trouble.